Much of HRD’s research is based on the use of in situ and remotely-sensed observations in the inner core of tropical cyclones and their surrounding environment to improve our ability to improve hurricane forecasts through evaluation of and assimilation into numerical models as part of NOAA’s Hurricane Forecast Improvement Project (HFIP). 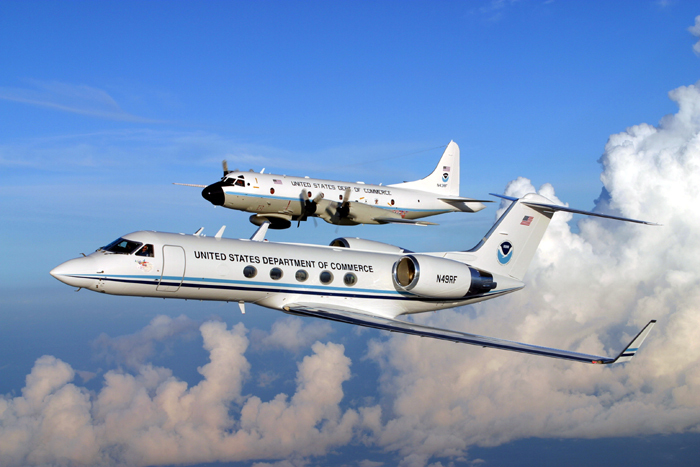 These observations are primarily collected during each hurricane season using two NOAA turboprop aircraft and a Gulfstream-IV jet operated by NOAA’s Aircraft Operations Center (AOC). The field program is used to carry out scientific experiments designed to address the goals stated above. Data sets gathered on these flights in all stages of the storm’s lifecycle are used to support operational needs and form the cornerstone of research in HRD. Because of this extensive field experience, HRD scientists are recognized internationally for their knowledge of tropical cyclones, as well as their expertise in technological areas such as airborne Doppler radar, dropsondes, cloud microphysics, and air-sea interaction, to name a few. These assets make HRD unique worldwide, and provide NOAA a unique capability. HRD coordinates its programs with other NOAA organizations, e.g., AOC, NESDIS, and NCEP, in particular with EMC and NHC. Our highest priority is the NOAA Intensity Forecast Experiment (IFEX) developed through a partnership involving HRD, NHC, EMC, and NESDIS. The goals of IFEX are the collection of data to directly aid the development and evaluation of the next generation operational tropical cyclone forecasting model system (Hurricane Weather Research and Forecast model system, HWRF). HRD maintains active research programs with, and receives funding from other governmental agencies, in particular, the Department of the Navy’s Office of Naval Research (ONR) and the National Aeronautics and Space Agency (NASA). In program areas where it is beneficial to NOAA, HRD arranges cooperative programs with scientists at the National Center for Atmospheric Research, and at a number of universities. HRD is working with these non-NOAA partners to integrate their hurricane research into IFEX.